In 2000, Hanahan and Weinberg published a landmark article in which they described the “hallmarks of cancer” – six biological capabilities acquired during the multi-step development of human tumors. It went on to become the most-cited Cell article of all time. In a follow-up article this year, the authors revisit their conceptual framework for cancer biology, incorporating the remarkable progress in cancer research that was made over the last decade. 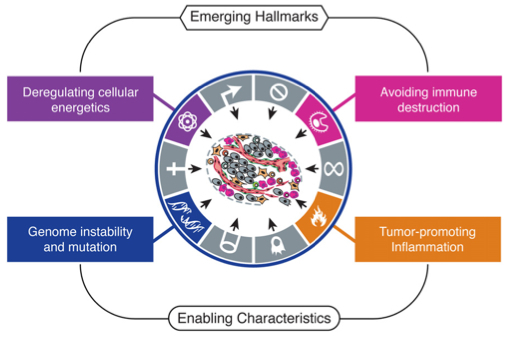 The authors conclude that their six hallmarks – sustained proliferative signaling, evading growth suppression, resisting cell death, replicative immortality, induction of angiogenesis, and invasion/metastasis – continue to provide a useful conceptual framework for understanding the biology of cancer. Further, they present two new hallmarks – reprogramming of energy metabolism and evasion of immune destruction – that have emerged as critical capabilities of cancer cells. I like to think that these new additions were perhaps inspired by two articles on Massgenomics earlier this year – Cancer versus the Metabolism (1/11/2011) and Cancer versus the Immune System (1/21/2011) – which I posted a couple of months before the new Cell paper. Clearly, these two concepts are drawing substantial attention from researchers and clinicians. Hanahan and Weinberg also elaborate on two “enabling characteristics” – properties of neoplastic cells that facilitate acquisition of hallmark capabilities. These include genome instability/mutation, which they discussed previously, and tumor-promoting inflammation, mediated by immune system cells that are recruited to the site of a developing tumor. It was Otto Warburg who first observed that cancer cells seem to favor glycolysis as a metabolic program over mitochondrial oxidative phosphorylation. This preference is normal in oxygen-poor environments. However, Warburg observed that tumors prefer glycolysis even in the presence of oxygen (aerobic glycolysis). This “metabolic switch” seems counter-intuitive, as the efficiency of glycolysis is 18-fold lower that oxidative phosphorylation. Cancer cells compensate for this, at least in part, by up-regulating glucose receptors (GLUT1) to import more glucose into the cytoplasm. Indeed, increased uptake and utilization of glucose has been reported for many human tumors. The functional rationale for this metabolic switch has not yet been elucidated. Preferential glycolysis has been associated with activated oncogenes and loss of tumor suppressors, both of which confer other hallmark capabilities on cancer cells. One possible explanation for the switch is that it enables diversion of glycolytic intermediates into other pathways, such as those responsible for synthesizing amino acids, nucleosides, and macromolecules. You know, the things necessary for making new cancer cells. Intriguingly, some tumors have two subpopulations of cells with different energy metabolism programs. One subpopulation exhibits the Warburg effect, favoring glycolysis and generating lactate along with those useful intermediates. The other subpopulation preferentially imports lactate, using it as the main energy source by harnessing part of the citric acid cycle. This apparently symbiotic relationship within tumors has provocative implications for the study and treatment of human cancers. It’s particularly because components of the citric acid cycle, specifically isocitrate dehydrogenases 1 and 2 (IDH1 and IDH2) have recently emerged as oncogenes that are recurrently mutated in gliomas and leukemias. In recent years, a substantial body of evidence from clinical epidemiology and mouse models has revealed that the immune system presents a significant barrier to tumor formation and progression. In immunodeficient mice, for example, carcinogen-induced tumors develop more often and progress more rapidly than in wildtype mice. Further, depleting either NK cells or T-cells in mice led to increased tumor incidence, suggesting that both innate and adapative immunity contribute to immune surveillance. Another important aspect of the relationship between immunity and cancer is the concept of “immunoediting”. In mouse models, carcinogen-induced tumors that arise in immunodeficient mice, when transplanted to wild-type mice, are usually eliminated by the intact immune system of the new host. In contrast, tumors induced in wild-type mice often grow when transplanted to other wild-type mice. Presumably, tumors induced in immunodeficient mice are highly immunogenic, and therefore easily identified and removed by a healthy immune system. However, tumors induced in wild-type mice have arisen despite an intact immune system. The selective pressure of the competent immune system “edits” the tumor by selecting for cells that can avoid immune destruction. Thus, by the time they are macroscopic, these tumors are poorly immunogenic, and more resistant to immune-mediated destruction. For years, pathologists have observed that most tumors are infiltrated by host immune cells, presumably ones that are attempting to destroy them. However, we now know that tumors actively recruit certain cells to aid in their growth and progression. Specifically, inflammatory cells of the innate immune system have been shown definitively to have tumor-promoting activity. In healthy tissues, inflammation serves a number of critical functions – fighting infections, wound healing, repair of damaged tissue and cells. To accomplish these duties, inflammatory cells produce an array of biochemicals that can benefit tumor growth, notably growth factors, survival factors, and matrix-modification enzymes. Furthermore, inflammatory cells can release mutagenic chemicals, such as reactive oxygen species, that increase the mutation rates in tumor cells, further accelerating their evolution towards more aggressive growth. Additional evidence supporting the tumor-promoting role of inflammation is the observation that individuals with chronic inflammation are more susceptible to cancers at the site of that inflammation – e.g. patients with Crohn’s disease show increased incidence of colorectal cancer. Indeed, it is now evident that inflammation is present even at the very early stages of some tumors, and capable of promoting their development into full-blown cancer. The ten years since Hanahan and Weinberg’s seminal article have seen remarkable progress in cancer research. Notably, the six hallmarks of cancer were further supported and refined, was was the enabling characteristic of genome instability. Two new emerging principles (reprogramming cellular energetics and avoiding immune destruction) became evident, as did a second enabling characteristic (inflammation). There’s a lot more in the current review that I didn’t touch on, such as the tumor-promoting activities of non-tumor cells (e.g. fibroblasts, pericytes) and the importance of cancer stem cells (CSCs). In coming years, thousands of tumors will be characterized by ever-more high-throughput technologies, such as massively parallel sequencing. Collecting the data is no longer the obstacle; instead, the true challenges lie in analysis and interpretation. Hanahan and Weinberg humbly describe their hallmarks as “organizing principles” for thinking about why cancer cells do what they do. Conceivably, fitting new catalogues of genetic alterations to this model of acquired capabilities will help us better understand the relationship between genotype (genetic susceptibility and somatic mutation) and phenotype (tumor development, growth, and metastasis).